As per the provisions of Section 18 of the Companies Act, 2013 a company of any class registered under this Act may convert itself as a company of other class under this Act by alteration of memorandum and articles of the company. 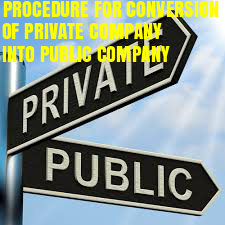 Section 13 and 14 of the Act read with Rule 33 of The Companies (Incorporation) Rules, 2014 states that a Private Company may convert itself into Public Company by passing Special resolution in General Meeting. 1. Issue notice along with agenda of board meeting in accordance with Section 173(3) read with Secretarial Standard 1 by giving not less than seven days notice in writing to every director at his address registered with the company and such notice shall be sent by hand delivery or by post (either registered or speed) or by electronic means or by courier, by facsimile or E-mail. 3. Prepare and circulate draft minutes within 15 days from the date of the conclusion of the Board Meeting, by hand/speed post/registered post/courier/e-mail to all the Directors for their comments and also follow the procedure prescribed in Secretarial Standard 1 for preparing, circulation, signing and compiling of Board Minutes. Provided that a general meeting may be called after giving a shorter notice if consent is given in writing or by electronic mode by not less than ninety-five percent of the members entitled to vote at such meeting. 5. Hold General Meeting and pass Special Resolution regarding Alteration of Article for conversion and Alteration of Name clause in MOA. 7. Increase the Number of members to minimum seven. 8. Increase the Number of directors to three. 9. Ensure that the signed and dated minutes of proceedings of extraordinary general meeting was entered in minutes book within 30days of the conclusion of the meeting and also follow the procedure prescribed for preparing, circulating, signing and compiling of Minutes in accordance with Secrtetarial Standards 2. (a) Intimate all the concerned authorities viz. tax department, banks etc about conversion. (d) Make necessary arrangements for new Common Seal and keep both old and new Common Seal in safe custody. (e) Have fresh copies of the altered memorandum and articles of association printed and give effect to certain changes in MOA and AOA in the Company.